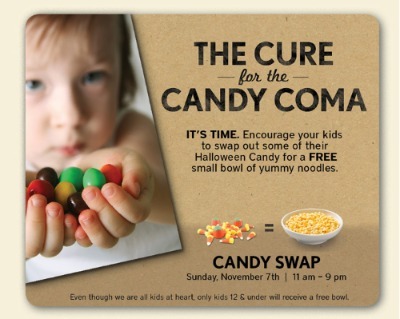 Noodles & Co has the cure for CANDY OVERLOAD! P has a bowl of candy from Halloween that weighs more than she does. Unless I sell my house to pay for her future dental bills, something’s gotta give. And then EUREKA! I received a Noodlegram from my buddies at Noodles and Company, who I LOVE. On Sunday, November 7th from 11am to 9pm, kids 12 and under can bring in some of their stash and swap it for a bowl of yummy (and a whole lot more nutritious) of noodles. Parents of Cincinnati – you’re welcome! Oh and sorry ’bout your luck Mr. Dentist! Filed Under: Things to Do Tagged With: Noodles and Co.